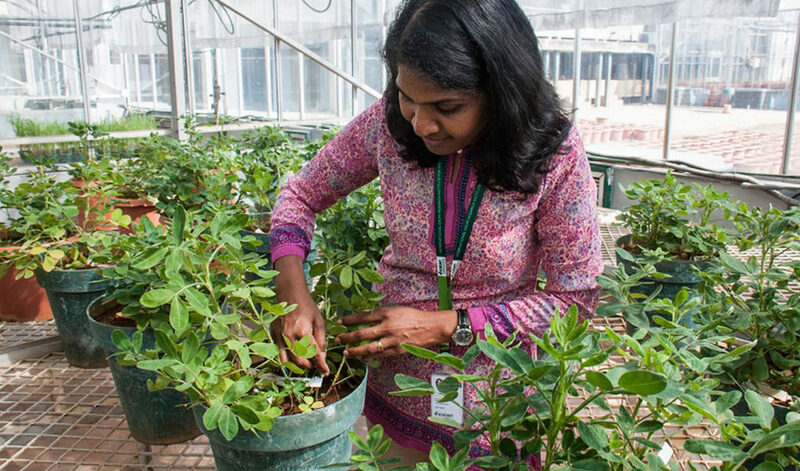 Hyderabad (19 January 2018): To respond to the growing demands for high oleic peanuts, groundnut scientists from the International Crops Research Institute for the Semi-Arid Tropics (ICRISAT) and partners across India have just developed the first-ever oleic-rich peanuts in Spanish and Virginia bunch types, adapted to Indian farm conditions. Until now, Indian groundnut farmers have not benefited from the fast growing global confectionary market, as they could not supply high oleic content peanuts as required by the confectionary industry. High oleic peanuts have tenfold lower oxidation compared to normal peanuts, improving its shelf-life from 2 to 9 months. It avoids rancidity and high oleic peanuts have much better flavour. Oleic acid or omega-9 fatty acid which can be found in olive and nuts like almonds also have important health benefits. 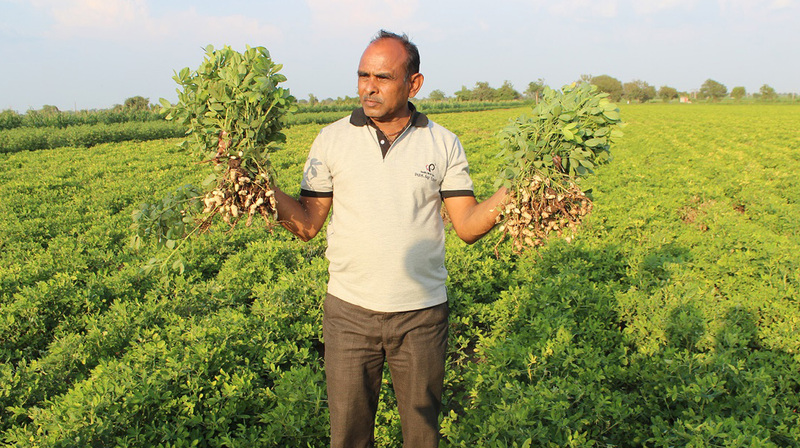 Currently, Indian groundnut farmers grow bunch type groundnut varieties adapted to rainfed environments, early maturing and with rapid filling of the pods after flash rains. Such groundnuts are however low in oleic acid, around 45 to 50% of total fatty acids. Certain groundnut varieties grown in America and in Australia are much richer in oleic acid (above 80%) thanks to specific mutations in the gene coding the enzyme fatty acid desaturase or FAD, which blocks the conversion from oleic acid to linoleic acid. At present, multinational confectionary companies are sourcing tons of high oleic peanuts from Australia for their Asian processing units, in order to respond to the growing Asian market of peanut-based confectionary products like chocolate bars and breakfast cereals. Knowing the cost of importing peanuts and rising global groundnut prices, leading food companies are seeking opportunities to locally source high oleic peanuts from India and other countries in Asia and Africa where they operate. Such market pull for high oleic groundnut varieties would improve incomes of many smallholder groundnut farmers. This strategic market-driven research is an on-going collaboration between ICRISAT, Indian Council of Agricultural Research (ICAR)-Directorate of Groundnut Research (DGR) in Junagadh, Gujarat, the Main Oilseeds Research Station of Junagadh Agricultural University (JAU), Palem Research Station of Telangana State Agricultural University, Oilseeds Department of Tamil Nadu Agricultural University (TNAU) in Coimbatore Department of Regional Agricultural Research Station and the Regional Agricultural Research Station of Acharya NG Ranga Agricultural University (ANGRAU) in Tirupati, Andhra Pradesh. Breeders were able to cut down costs and crop selection time from hybridization to national testing trials from 10 to 6 years, thanks to several innovations including rapid-generation advancement, the use of single nucleotide platform (SNP) marker-assisted selection to screen oleic acid-rich FAD mutants among thousands candidate lines and near infrared reflectance spectroscopy (NIRS) for robust and non-destructive phenotyping. Since 2016, best-bet lines have been tested across India and shared with partners in Asia-Pacific region and African countries that include, Tanzania, Uganda, Ghana, Mali, Nigeria, Myanmar and Australia. The improved lines show similar or even superior productivity than the current check varieties grown by local farmers. Sixteen high oleic lines have been tested in a national multi-location trial, for their agronomic performance and market quality, under the All India Coordinated Research Program on Groundnut during 2017. It was the first-ever “specialty” trial in India for groundnuts. Results from 2016 multi-location testing show well-adapted lines for the major groundnut producing States of India (Gujarat, Tamil Nadu, Telangana and Andhra Pradesh), that perform better than farmer-preferred local varieties (from 5-15% up to 84% yield increase) and oleic content over 80%. Recent sensory testing of these newly bred high oleic lines, conducted in collaboration with a global confectionary food company, has revealed equivalent flavour quality to the confectionary high oleic peanuts normally used by the industry. ICRISAT is engaged with an innovative farmer organization from Gujarat, Khedut Foods and Feeds, a Gujarat company, which works with 8,000 small farmers with average farm size between 1 to 2.5 acres. This farmer organization is already engaged in seed multiplication and production of good quality commodity to meet food safety standards as they understand farmers need to grow what the market wants. Khedut proposes premium prices for farmers that respect good crop management practices (incorporate organic soil matter in the soil, avoid drought, storage and harvest conditions) to prevent aflatoxin contamination, another prerequisite of the food industry. This research enabling the fast-track development, testing and commercialization of ‘high oleic’ groundnut varieties that can be grown in the 4.8 million hectares of groundnut belts of India has been funded by the National Mission of Oilseeds and Oil Palm (NMOOP), Department of Agriculture and Cooperation (DoAC) of Government of India.